Our SITE VISIT & DESIGN ADVICE is a great place to start. Our Architect will carry out some initial research on your property then visit your property, view it, review any available property information, listen and talk to you about your project intentions, then give you some great design ideas to get your project started. Save money and time. Get some certainty about your project. CLICK HERE to book our Architect NOW. Come to our office, bring the documents of the building you are planning. Our Registered Architect will listen and talk about your project objectives and give you some good design thoughts to get your project happening. CLICK HERE to book your consultation NOW. For great creative architectural design ideas, keep up with the latest building news. CLICK HERE to register and receive our FREE Architect and Architecture Newsletters. 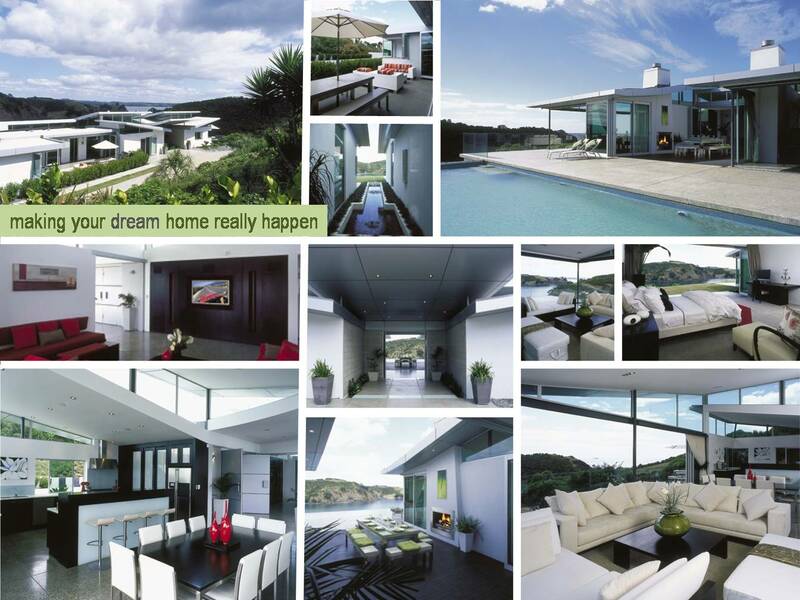 This great residential house on Waiheke Island, featured in TRENDS, is a cluster of elegant pavilions that are separated by beautiful water features and sheltered outdoor areas. The pavilions which meander across the site are linked by a gallery and as you move through the house the water features and different distant views are revealed. The layers of soaring roofs imitate the topography and open up to let light penetrate deep into the pavilions. The roofs are suspended on glass walls that are moved aside allowing the indoor to become outdoors. Click HERE to view the TRENDS feature. 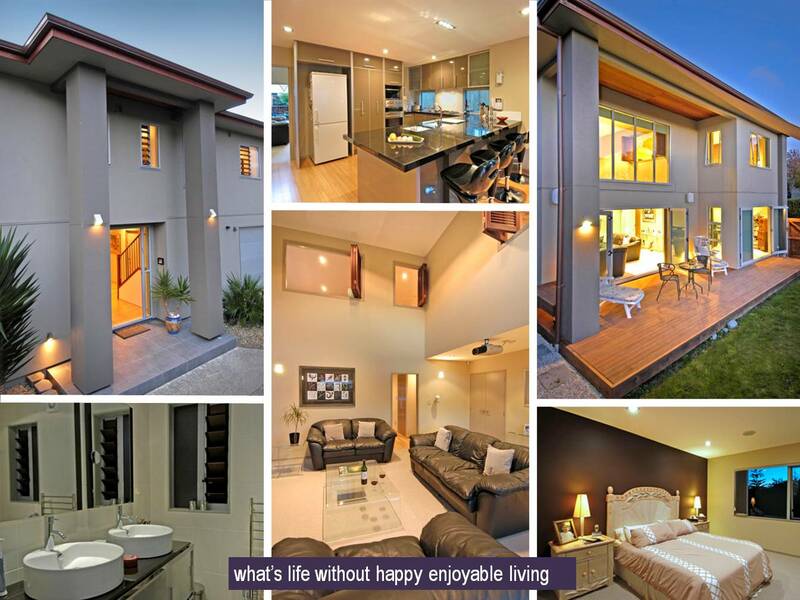 This great home has more than enough room for its family with a central kitchen that separates the informal and formal areas to suit family activities. Both the Living and Family Rooms are double height rooms giving a feeling of spaciousness. Rooms in the upper levels have windows that can be opened up to the Living and Family Rooms voids. 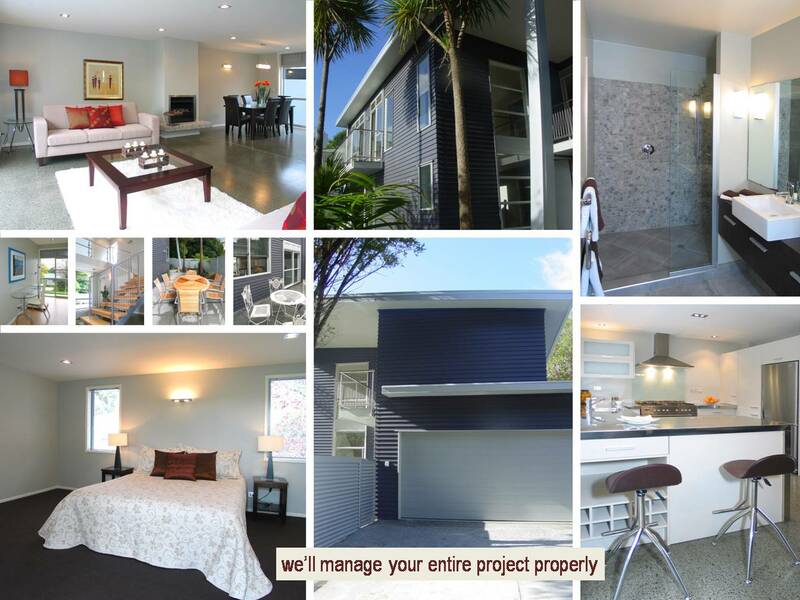 The internally accessed garage and efficient floor plan allow convenient living in this St Heliers home that captures all day sun. 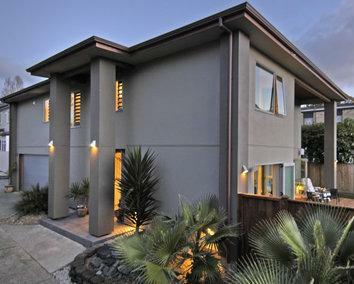 The clients wanted a three bedroom, contemporary, open plan house. The brief was to employ contrasting materials incorporating mono pitch roofs with large overhanging eaves and offset walls to create complexity. An existing house on the site was to be retained, leaving an area 230 square metres for the new house in which several mature trees were located. The design concept for the site was to form three volumes. Two for internal spaces, offset to create the third volume of external space. A large roof is supported by an inclined column producing a transition between the internal and external spaces. The mature trees sit strikingly against the charcoal coloured linear-board backdrop of the exterior walls while the zincalume clad eaves blend into the blue sky. At the ground level living spaces connect seamlessly and a light filled void is transcended to the generous sleeping areas hovering above. Movement from inside to outside occurs at every opportunity while a crisp interior of polished concrete and stainless steel blend softy with natural timber and warm white ensuring a relaxing atmosphere. Although the client insisted on floor heating, at last report they haven’t used it because “the house is so warm”. 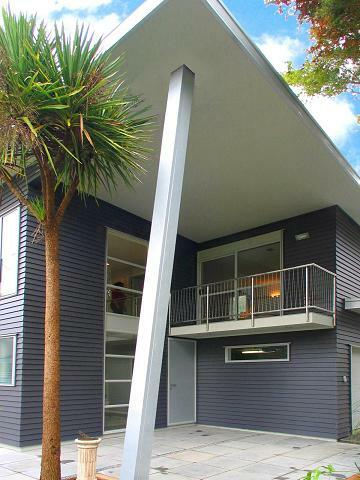 This house which is located in Kohimarama has been cited as a "Best House Design". Even though this unique house is located high on a ridge and a kilometre from the sea, when inside the house the views of the sea appear really close. 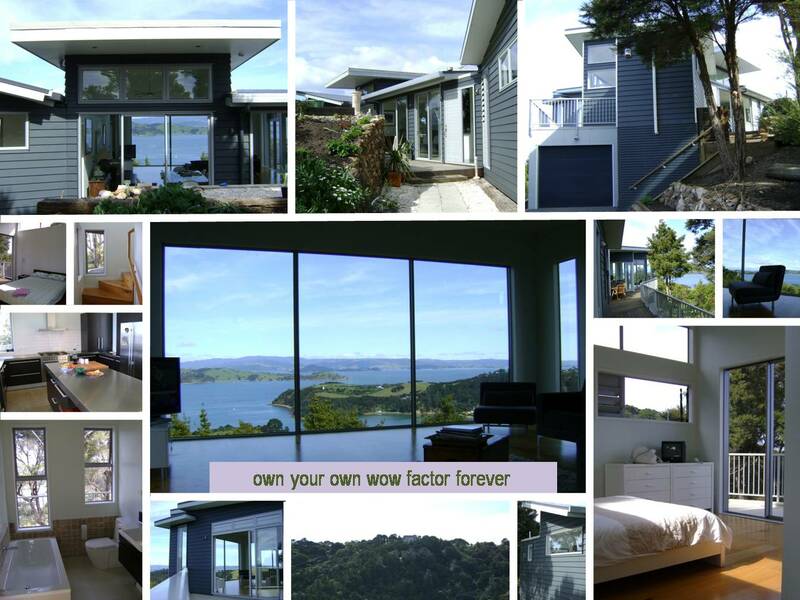 This creative Waiheke Island house has great indoor/outdoor flow and opens onto three separate outdoor areas so there is always a sunny spot sheltered from the wind and great for entertaining. The floor plan wraps gently to the land contour so as one moves through the house different views are experienced. 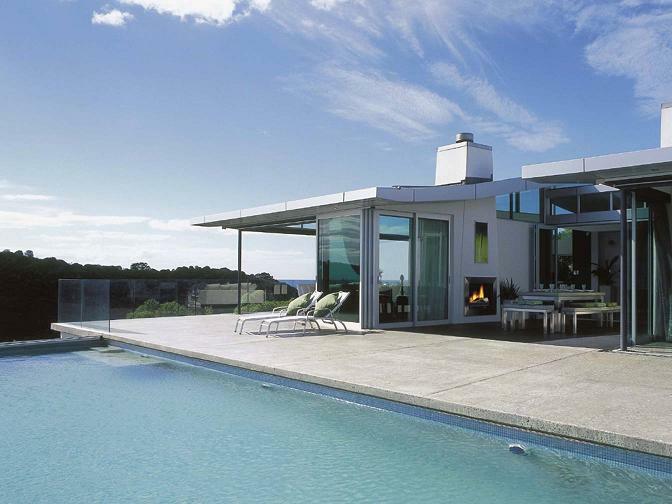 The large expanses of glass allow one to see through the house and stay in contact with the ever changing seascape.